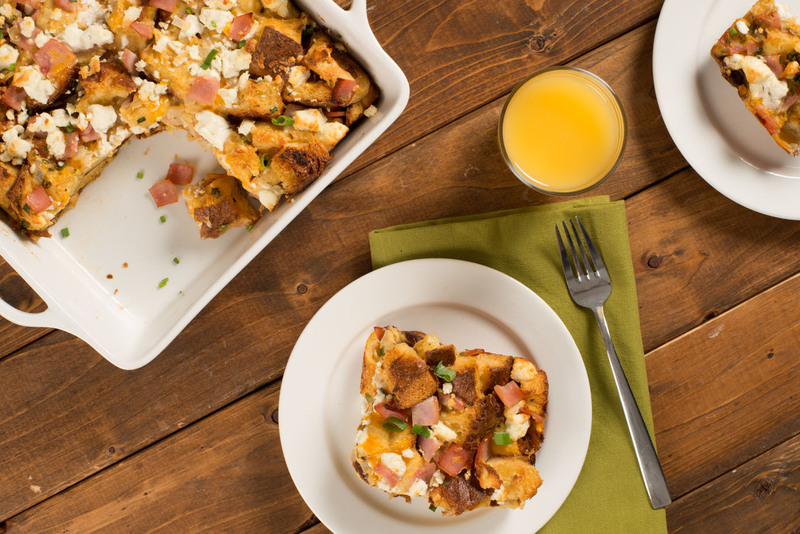 Brunch is easy with this egg and bread pudding studded with bacon. Melt butter in sauté pan set over medium heat; cook onion and garlic for 3 to 5 minutes or until softened. Let cool slightly. Whisk together eggs, milk, mustard, chives, thyme, paprika, salt and pepper; stir in bread cubes, bacon, Cheddar and onion mixture. Transfer to greased 8-inch square baking pan. Sprinkle goat cheese evenly over top. Bake for 50 to 55 minutes or until puffed and golden and custard is set. Mixture can be covered and refrigerated for up to 24 hours before baking. You can substitute any day-old bread for the brioche.